Our February update features some really excellent examples of the ever popular Neuschwanstein Castle coffee table by the Buchschmid and Gretaux Wood Inlay Company.. 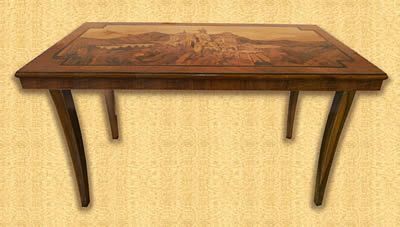 This is a truly wonderful example of a B & G Neuschwanstein Castle Coffee Table. 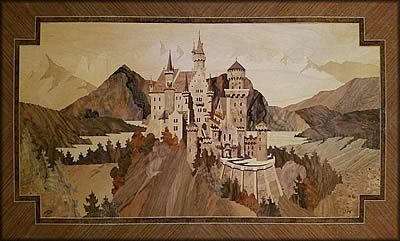 Our February update features a superbly picturesque view of Neuschwanstein Castle inlaid on a magnificent coffee table made by the Buchschmid and Gretaux wood inlay company. This lovely coffee table is currently owned by Rachel Smith. The photo is a "head on" view of the top surface of the table. It is in original condition and does have some surface checking in the varnish, which is quite normal for a piece of this vintage. We have to admit that we don't see many of these Neuschwanstein Castle inlaid coffee tables at all, in fact this is only the second example we have encountered in all the years we have been publishing these B & G pages. Rachel asked us for the best way to look after and maintain this table. Our answer is to keep it out of direct sunlight (it has a bleaching effect over time) and place a small container of water in the near vicinity to the table (not on it, as water mat seep into the varnish checking and could lift the veneers). The vapour from the water will provide sufficient hydration to help maintain the correct conditions for the table. You can also use a smear of lemon oil to preserve the table. Rachel has reluctantly said she may consider selling the table. But interested parties please do read the disclaimer displayed on the right. We (the Marquetry Society) do not, and will not, act as brokers, intermediaries or sellers for, or on behalf, of any of our contributors. We will however, and purely as a goodwill gesture, forward your enquiry onto the owner of the piece in question so that you and the owner can conduct any sales or transactions personally and between yourselves. Our strict policy is that we do not become involved in any transactions other than our own which have previously been verified and agreed by our executive committee at a meeting set up for that purpose. The forwarding of your enquiry will be done strictly as a goodwill gesture and for no other purpose. Click the above button to return to page 66 of "Can You Help"